A layer of stratocumulus clouds over the Pacific Ocean served as the backdrop for this rainbow-like optical phenomenon known as a glory. 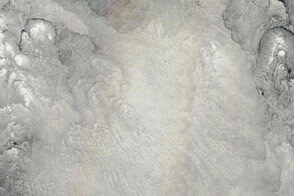 Glories generally appear as concentric rings of color in front of mist or fog. They form when water droplets within clouds scatter sunlight back toward a source of illumination (in this case the Sun). 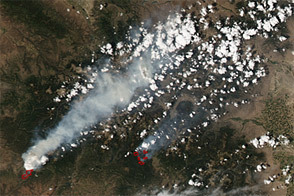 The Moderate Resolution Imaging Spectroradiometer (MODIS) on NASA’s Terra satellite acquired the image on June 21, 2012. The image was saturation-enhanced to make the glory effect more visible. 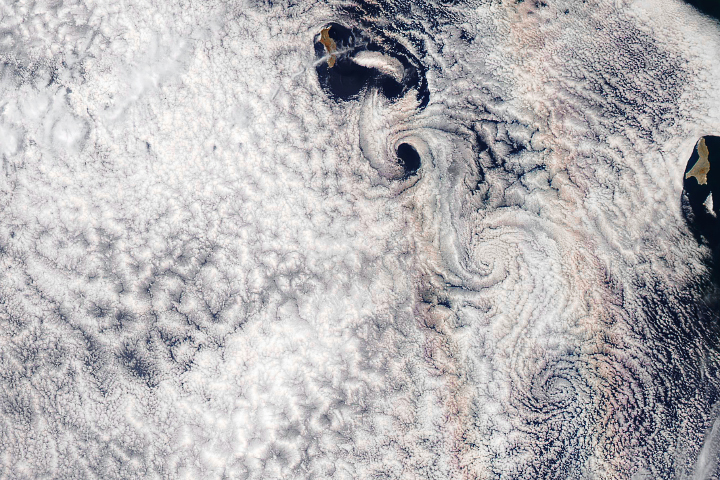 Another notable feature in this image are the swirling von karman vortices that are visible to the right of the glory. 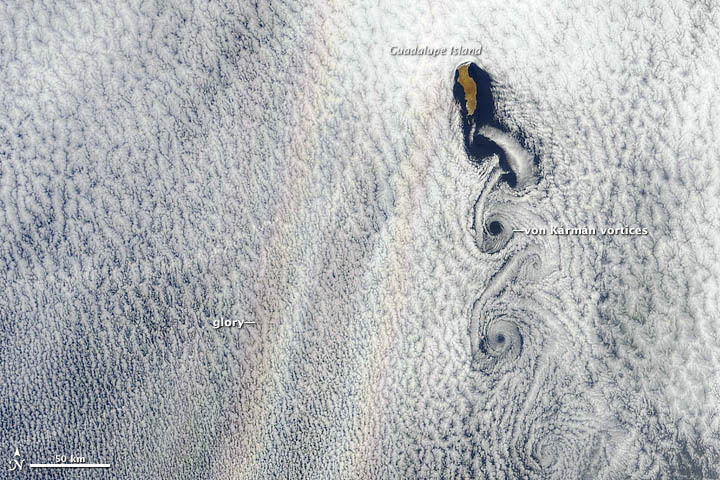 The alternating double row of vortices form in the wake of an obstacle, in this instance the eastern Pacific island of Guadalupe. 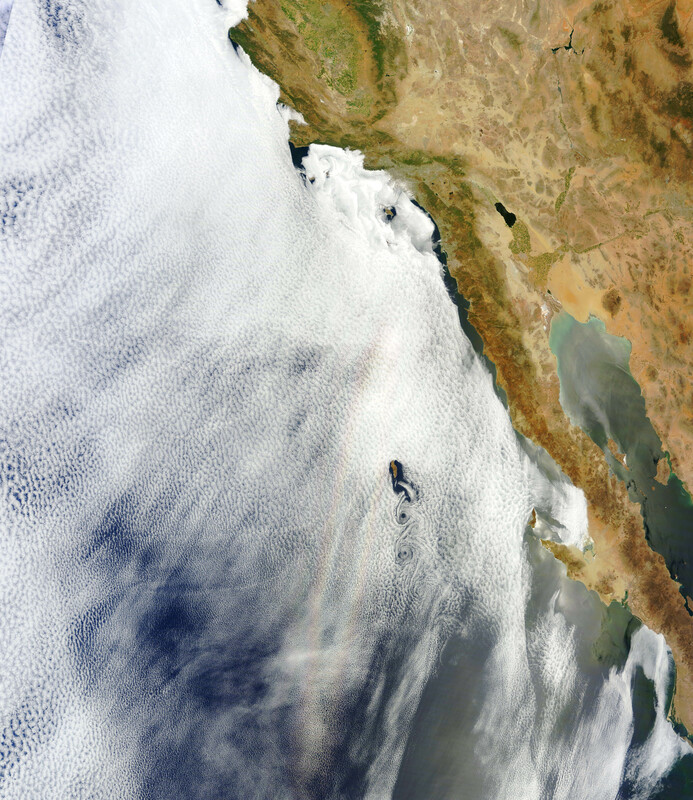 The Terra satellite captured a rainbow-like optical phenomenon called a glory over the Pacific Ocean. Water droplets within clouds scatter light to produce the effect. Atmospheric Optics. (n.d.) The Glory. Accessed June 26, 2012. Gedzelman, S. (2003, January 20). Simulating Glories and Cloudbows in Color. Applied Optics. Floor, K. (2012). Glory from Space. Accessed June 26, 2012. Israelevich. P..L. (2009, December). First Observations of Glory from Space. Bulletin of the American Meteorological Society. Laven, P. (2005). How are Glories Formed? Applied Optics. Laven, P. (n.d.) Glories and Brocken Spectre. Accessed June 26, 2012.